I recently had a home inspector ask me how hot is too hot when it comes to circuit breakers and switches. Many home inspectors, including all of the inspectors here at Structure Tech, use infrared cameras during home inspections. These cameras can’t see through walls, but can often alert us to problems with a house that can’t be seen with the naked eye. We frequently come across warm circuit breakers, warm dimmer switches, and even warm electrical panels during our home inspections. So how warm is too warm? It depends. I know, it’s kind of a blowhard answer, but there’s no one-size-fits-all answer. I don’t use my infrared camera as a quantitative tool; I use it as a qualitative tool. Yeah, I know, more blowhard words. Put simply, I’m not too concerned with the exact temperatures that are displayed on my infrared camera. As a home inspector, what I’m concerned with and what I dig into are the meanings behind unexpected temperature differences, aka anomalies. If I scan a ceiling and I find a cold spot that doesn’t make any sense, I dig into it. Maybe it’s a plumbing leak from above, or maybe it’s just a cold water line that’s touching the ceiling. That’s where a moisture meter comes in handy. Ok, I’m getting sidetracked. Let’s discuss some electrical examples. A properly wired, properly functioning dimmer switch can get hot to the touch. I’ve found that a 65-degree temperature rise is normal for a maxed-out dimmer. If the ambient temperature is 71 degrees and a dimmer switch is at 136 degrees, I’d be concerned, but I wouldn’t report the temperature as a problem. I would, however, take an extra minute or two to figure out how many watts the dimmer is rated for. I’d then make sure there wasn’t too much being controlled by the dimmer. The dimmer switch for the kitchen lights was rated for up to 600 watts, but the wattage at the lights was more than this; there were ten 65-watt bulbs on this circuit. This caused the front of the switch to get extremely hot, and creates a potential fire hazard. Have this corrected. You’ll notice that I didn’t explain exactly how to correct this. I do this intentionally because I’m not going to do the work. This situation could be easily fixed by replacing the dimmer switch with a simple toggle switch, by installing a dimmer rated for a higher wattage, or by installing bulbs with a lower wattage. Any of those would be fine, but as the home inspector, I don’t design the repairs. I can’t think of any good reason for a toggle switch to get hot. If I ever found a hot toggle switch, I’d call that a fire hazard and recommend repair. When a circuit breaker has a lot of current flowing through it, it will get warm. 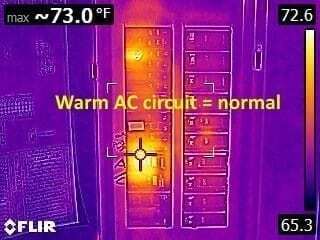 The warm 15-amp circuit breaker shown below had a 15.6-amp hair dryer running for about 20 minutes, and it warmed up to about 17 degrees over ambient. It wasn’t especially hot, but it was definitely overloaded. I’d like to say that if a circuit breaker is X-degrees over ambient, it’s a problem… but there’s just no hard and fast rule for this. I can’t say this. If I find a warm circuit breaker, I take a logical approach. First, is there a good reason for the circuit breaker to be warm? A 240-volt appliance like an air conditioner will definitely warm up a circuit breaker while it’s operating. No problem there. The image below shows a warm circuit AC circuit, but in this case, I do care about the temperature readings. This circuit is only about 8 degrees warmer than anything else in the image. This is not a significant difference, and it makes sense. You’ll notice that there’s a single general lighting circuit that’s warmer than the other breakers in this panel; again, it’s only a small increase in temperature, so I’m not concerned. If it were much warmer, I might question why. To take it a step further, I’d take the time to measure the amperage on the circuit. 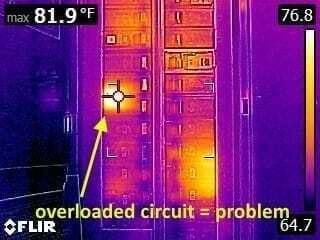 I wrote a blog post dedicated to that topic, titled Using an infrared camera to find an overloaded circuit. 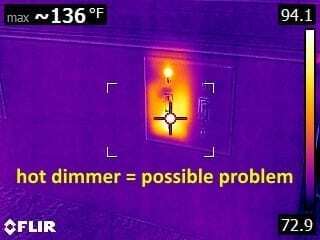 Many home inspectors are opposed to doing this type of test, and I say those home inspectors shouldn’t bother scanning an electrical panel. If a home inspector isn’t going to measure amperage, I don’t know how they could report on an overloaded circuit. Arc-Fault Circuit Interrupter (AFCI) circuit breakers run warm. This is normal, there’s nothing to report here.